The iConverter NMM2 provides comprehensive remote monitoring, configuration and alarm notification functions for all iConverter managed media converters and Network Interface Devices (NIDs). Installed in any slot of an iConverter chassis, the NMM2 manages all other modules and power supplies installed in the chassis through a high-speed management backplane. The iConverter NMM2 provides comprehensive remote monitoring, configuration and alarm notification functions for all iConverter managed media converters and Network Interface Devices (NIDs). Installed in any slot of an iConverter chassis, the NMM2 manages all other modules and power supplies installed in the chassis through a high-speed management backplane. Additionally, all remote NIDs linked to the managed iConverter chassis can be managed by the installed NMM2 through a secure IP-less management channel. 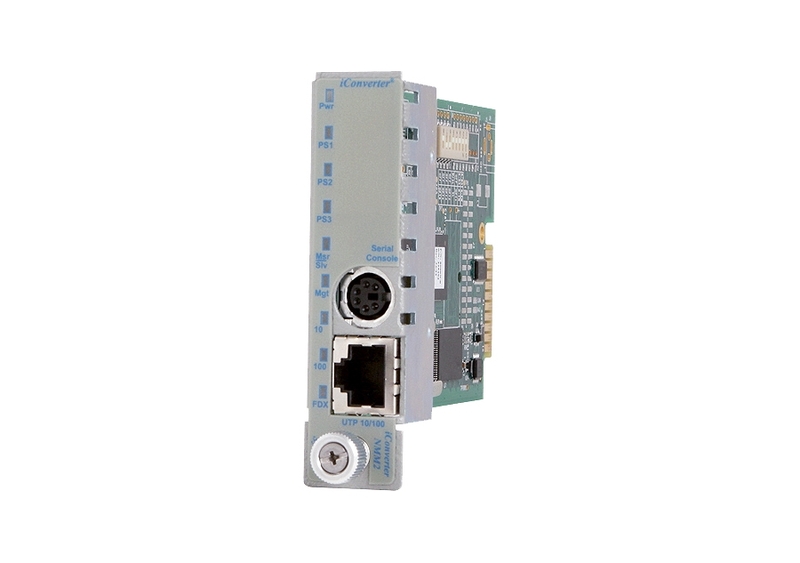 Through the 10/100 RJ-45 Ethernet port, the NMM2 can be remotely accessed by IP-based management protocols, including SNMPv1/2c/3, TELNET and FTP. The serial console port provides local access and initial configuration from an RS-232 terminal. Management is accessed either via NetOutlook®, Omnitron’s SNMP Management Software, or by any third party SNMP management software. An intuitive Command Line Interface (CLI) can be accessed either via the serial port or TELNET. The NMM2 provides real-time management, continuously collecting system status and module information. It reports the collected status to the network management applications and displays LED alarms for chassis power supplies. The NMM2 also provides comprehensive provisioning support for all local and remote iConverter modules, including port settings, VLANs and rate limiting. Network alarms are forwarded as traps to multiple trap hosts and recorded in a persistent system log. In the event of a power outage, the NMM2 also supports dying gasp SNMP trap notification when installed in a 1-Module or 2-Module chassis with dying gasp support. 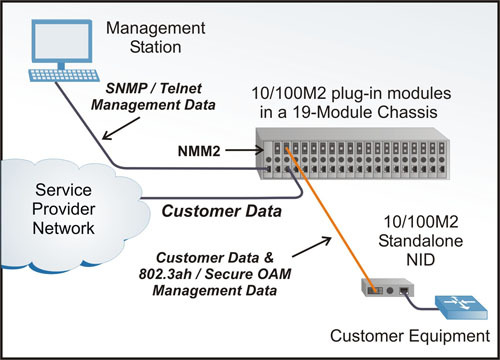 The NMM2 manages remote NIDs connected to the managed chassis via an IP-less management channel. Utilizing IEEE 802.3ah extensions, an NMM2 in a chassis at the network core can use a single IP address to manage up to 18 iConverter Network Interface Devices (NIDs) at different edge locations. This capability simplifies IP address management, improves network security and conserves the use of IP addresses. In this application example, iConverter 10/100M2 plug-in modules are installed in the 19-Module chassis, and connected via the fiber link to a standalone 10/100M2 Network Interface Device (NID). With an NNM2 installed in the 19-Module chassis, an IP-less management channel between the 10/100M2 link partners is established. The IP address resides only at the network core (NMM2), and does not exist on the customer network. For extended temperature (-40 to 75°C), add a "Z" to the end of the model number. Contact Omnitron for RoHS (5/6) compliant models.